Turns out that the recent XFastest leak about the 9th generation Intel 'Coffee Lake-S Refresh' was a bit outdated. 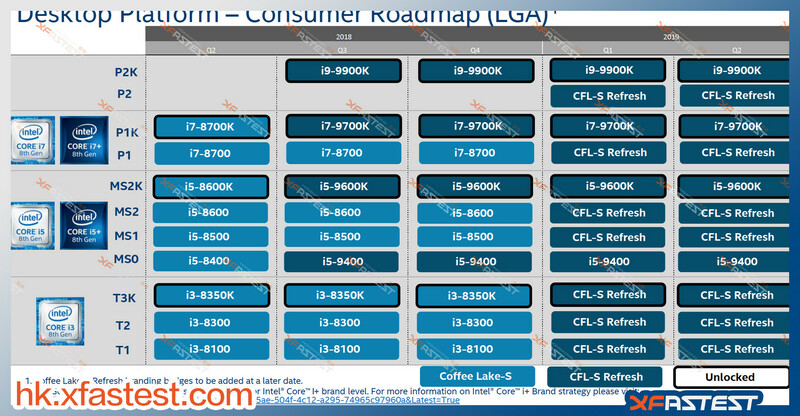 New slides have emerged that confirm the 9th gen CPU launch in Q3 2018 itself. Adding credence to this is another roadmap via HKEPC that confirms an October 2018 launch window. This will also be the time when the Basin Falls Refresh is expected to launch. 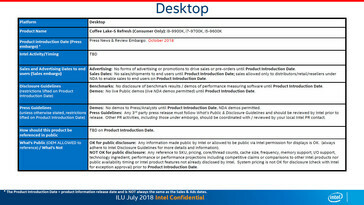 We reported yesterday of a somewhat surprising development leaked by XFastest that the Intel 9th generation 'Coffee Lake-S Refresh' CPUs such as the Core i9-9900K and the Core i7-9700K will be launching in Q1 2019 instead of the anticipated Q3-Q4 2018 timeframe. Now, it appears that XFastest actually leaked an older version of the slide. 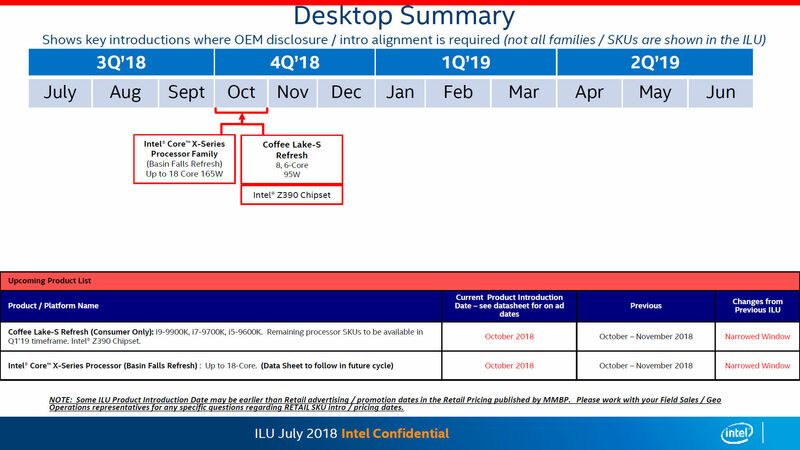 New slides are now available, which show the Intel 9th generation launch in Q3 2018 as was originally expected. 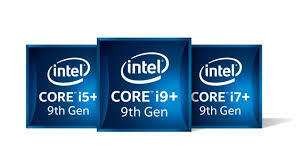 This includes the Core i9-9900K, Core i7-9700K, Core i5-9600K, and the Core i5-9400. More SKUs will probably be made available over the course of Q1 and Q2 2019. The updated information aligns what we've been expecting so far. 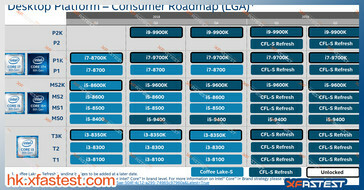 HKEPC has also leaked a roadmap slide showing a more exact time for the 'Coffee Lake-S Refresh' and Basin Falls Refresh reveal. Both these CPU families will launch in October 2018. 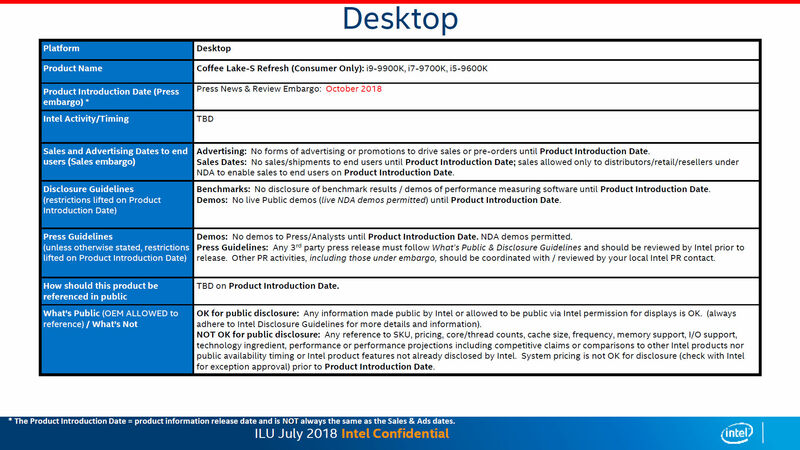 HKEPC's slides just mention that the Core X-series Basin Falls Refresh 18-core 165W chip will launch this October but there is no explicit mention of the 'Cascade Lake X' 28-core CPU that Intel showed off during Computex 2018. So, that should clear up any function regarding the Intel 9th generation desktop CPU launch. Thankfully, we won't have to wait till next year to test these new chips. As already reported, the mainstream desktop CPUs will be launching on the Z390 platform while the Basin Falls Refresh will continue to be powered by the X299 chipset. Here's hoping another roadmap leak doesn't spoil the fun.